Chelsea captain John Terry said in court he was 'very angry and upset' when he thought QPR's Anton Ferdinand had accused him of racism. The thirty one years old is accused of calling Ferdinand a 'f****** black c***' during a Premier League match on October 23 last year. He says he was sarcastically repeating the words that QPR centre-half Ferdinand mistakenly thought he had used. 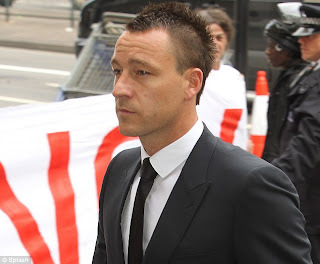 Terry is accused of a racially aggravated public order offence, which he denies. He told Westminster Magistrates Court that as the pair traded insults, he heard Ferdinand say: 'calling me a black c***'. 'I thought he was accusing me of calling him a black c***. I was very angry and I was upset. 'I replied "a black c***, you f****** knobhead". The father of two, wearing a dark suit, had to be told to keep his voice up at times as he gave evidence. He said he was 'frequently' insulted on the pitch and had 'heard it all before'. During the match at Loftus Road last year, Terry said he and Ferdinand first began trading insults when Ferdinand called him a 'f****** prick' because a Chelsea player had not given the ball back to QPR. Terry then ran back to his position and turned round to face Mr Ferdinand. 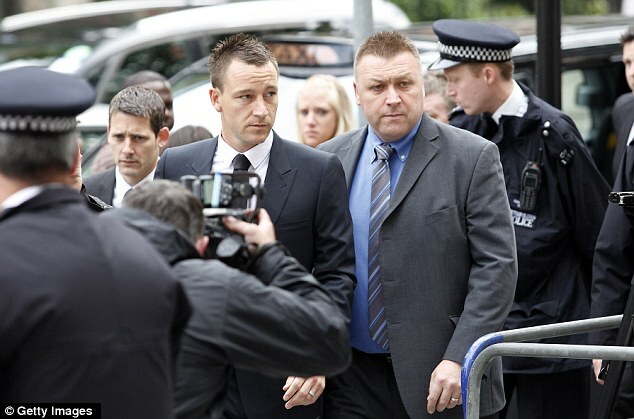 'He was doing a pumping action and saying "shagging Bridge's missus",' Terry told the court. He said he did not remember the exact times he learned of the investigations but said he was 'making contact and arranging to go in and sit down, offering my assistance basically. Terry said that after the match, he asked Ferdinand twice if he had accused him of using the racist obscenity. 'I said: "I thought you were accusing me of calling you a black c***". 'His reply to that was "no, no, no. We all said things we shouldn't have said, that's the end of it". 'I asked him twice and he said no, I thought that was the end of it. In cross examination, prosecutor Duncan Penny put it to Terry that insults about the alleged affair were a 'no-go area'. He asked why, on Terry's account, he had repeated the racial abuse because he thought Ferdinand was accusing him of using the slur. Mr Penny said: 'You said that your response was to repeat back "a black c***", or "calling me a black c***?" But he denied that he had 'snapped' with Chelsea struggling in the match and after being insulted. 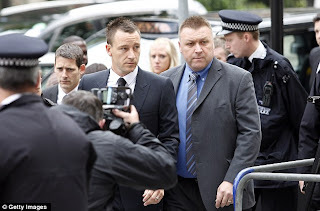 Terry said he had not considered apologising to Ferdinand because the QPR player had accused him.